We’d love your help. Let us know what’s wrong with this preview of Blue Mountain by Martine Leavitt. To ask other readers questions about Blue Mountain, please sign up. Tuk is a Bighorn Sheep, and when he is born it is foretold that he will save the heard from scarcity of food and the threat of predators. As Tuk leads the heard of Bighorn Sheep to the Blue Mountain, he and the heard must weigh the consequences of taking an unknown journey and decide if this will lead them to safety or to their undoing. This novel, by Martine Leavitt, touches on the environmental impact of urban sprawl, and offers a picture of what life is like for Bighorn Sheep. This novel had m Tuk is a Bighorn Sheep, and when he is born it is foretold that he will save the heard from scarcity of food and the threat of predators. As Tuk leads the heard of Bighorn Sheep to the Blue Mountain, he and the heard must weigh the consequences of taking an unknown journey and decide if this will lead them to safety or to their undoing. This novel, by Martine Leavitt, touches on the environmental impact of urban sprawl, and offers a picture of what life is like for Bighorn Sheep. This novel had many successful elements. Leavitt is a masterful wordsmith, and she was able to describe events and locations in the book quite vividly. The book included trickster tale elements, and I also picked up on traces of Native American folklore. The characters in this story were thoughtfully planned out, which helped the reader get a glimpse of each character’s personality. The need to get to a safe place with food is what motivates and propels the characters, and each character has their place in the heard. Although the main character, Tuk, does not change much in the story, the reader is able to see him as a natural leader who can make quick decisions in stressful situations. The other characters are also well developed. Rim and Ovis are other strong leaders and Dall is the wise woman of the heard. Mouf is the weakest of the herd, and she needs constant motivation. The interactions between these characters shed light on decisions made in the story. Conflict is successfully interwoven throughout this story. The heard deals with scarcity of food and fear of predators and humans. The conflict helps propel the story, because each difficult situation forces the heard to make a decision. I'm the wrong reader for this book because I hate animal stories. And this one wasn't compelling enough to help me overcome that. It's about sheep ya'll. Sheep. Gentle adventure story for middle schoolers who love endangered animals. The bighorn sheep are anthropomorphized if animal fantasy is a problem for you. But their struggle for survival is real. Excellent book for young people!! Something I'd like to mention is that it seems like a children's book. The way the story is told seems very simple and plain, but then again, so is the general plot! There isn't really much to review either; this book is less than 200 pages and is about bighorns. I think the best way to summarize this entire book is "quaint". In other words, "attractively unusual or old-fashioned." -Google. The plot is folk-like and it's characters are animals. One thing that I did enjoy was the whole way "animal perspective" was interpreted. Martine narrated the story in a way I have not personally seen before. Tuk does not have strong "human-like" characteristics. He is still relatable in some senses, but most of his emotions stem from living for survival(something we humans also face). I'm having trouble pinning down my exact feelings on this interesting, but strange, little book. On one hand, I loved the concept and the message, but on the other hand, the writing style was hard for me to get used to. As I mentioned, I loved the idea and message behind this book. I think it is immensely important for kids (and adults!) to understand the natural world and that our actions can affect plants and animals and ecosystems. So for that I give huge kudos to Martine Leavitt. However, the I'm having trouble pinning down my exact feelings on this interesting, but strange, little book. On one hand, I loved the concept and the message, but on the other hand, the writing style was hard for me to get used to. However, the writing style really threw me on this one. It was kind of blunt and chopping and the dialog came through very strangely for me (although since I don't speak bighorn, maybe that's how they do speak). I feel like maybe this writing style would appeal more to younger middle grade readers, since it was quite simple and they may not mind the choppiness when their own reading skills are a bit lower than my own. However, I think older readers might have some of the same issues as me (I even considered DNFing this one, but am glad I didn't). The other thing I wasn't crazy about were the amount of characters. We are thrown a lot of names at the beginning when all the lambs were born and it was tough for me to keep track of them. Eventually they begin to become their own characters, but it was still a bit difficult for me for much of the book. 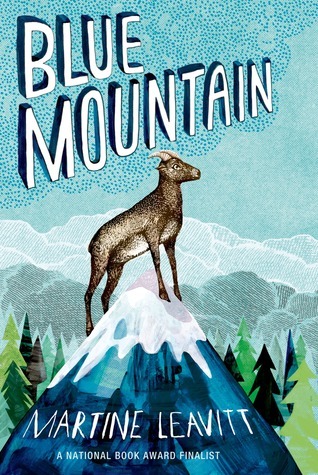 Blue Mountain by Martine Leavitt is a quirky, tender book that follows the life of Tuk, a bighorn sheep. Humans are encroaching on his herd's territory, and Tuk is the only bighorn who can see the faraway Blue Mountain, a place where his herd might be able to live in peace. Blue Mountain is a quiet and rather short middle grade book. It's a simple story, with a straightforward plot and kid-friendly vocabulary. Yet it's also a profound look at a serious and timely subject––human impact on the natu Blue Mountain by Martine Leavitt is a quirky, tender book that follows the life of Tuk, a bighorn sheep. Humans are encroaching on his herd's territory, and Tuk is the only bighorn who can see the faraway Blue Mountain, a place where his herd might be able to live in peace. Blue Mountain is a quiet and rather short middle grade book. It's a simple story, with a straightforward plot and kid-friendly vocabulary. Yet it's also a profound look at a serious and timely subject––human impact on the natural world––and a sobering meditation on what other species must do to adapt. Leavitt's story is a great reminder that being an animal is tough. Humans aside, there are predators and challenges around every corner for Tuk and his herd. But Tuk is resilient and resourceful. Despite its subject matter, the book is ultimately uplifting. Despite the book’s sweetness, I was left feeling pretty down about human impact on the bighorn’s territory. But perhaps that’s part of what Leavitt wants to do here––inspire her readers to think about how human actions change the lives of our animal kin. I hope all the Tuks out there can find their Blue Mountain. Well. This is a solid, and often lovely, animal fable. But it's not - quite - "Bambi", and it certainly isn't "Keturah and Lord Death". Tuk is the largest mountain goat kid born in generations, a natural leader. His people are under assault by predators and by man. At first, the others think Tuk might be a the leader to save them, but, when he kills a cougar kit in defense of a friend, the elders are deeply disturbed. His folk are peaceful; they do not fight back. Will Tuk become the leader he s Well. This is a solid, and often lovely, animal fable. But it's not - quite - "Bambi", and it certainly isn't "Keturah and Lord Death". Tuk is the largest mountain goat kid born in generations, a natural leader. His people are under assault by predators and by man. At first, the others think Tuk might be a the leader to save them, but, when he kills a cougar kit in defense of a friend, the elders are deeply disturbed. His folk are peaceful; they do not fight back. Will Tuk become the leader he seems destined to be? Leavitt achieves a stately tone very suitable to her story, and she keeps the reader's interest (at least, this reader!). But I was bothered by the antrhopromorphism. Animals just don't seek revenge, though they do mourn. To have the vengeful cougar pursuing the flock was a bit much. This animal fantasy is told from the perspective of a year-old bighorn sheep who has a vision of a mountain where his dwindling herd can prosper, and leads a scouting party to ascertain whether it really exists. They face many challenges in the natural world, but the greatest for Tuk comes from man - biologists who capture and tag him. I believe this practice to be inhumane, and what Tuk submits to in order to free himself of the tag in his ear reminds me of what I've heard of animals caught in This animal fantasy is told from the perspective of a year-old bighorn sheep who has a vision of a mountain where his dwindling herd can prosper, and leads a scouting party to ascertain whether it really exists. They face many challenges in the natural world, but the greatest for Tuk comes from man - biologists who capture and tag him. I believe this practice to be inhumane, and what Tuk submits to in order to free himself of the tag in his ear reminds me of what I've heard of animals caught in traps and what they'll resort to in order to free themselves. The things we do to animals in the name of research and supposedly for their own good disgusts me..
A touching story about a band of bighorn sheep making a journey to find a new place to live when their mountain home is threatened by encroaching human development. Along the way they encounter a wolverine, a bear, and a cougar. The young bighorn sheep, Tuk, who leads the band is put through the paces. The author doesn't spare him trouble. Tuk's responses to each confrontation are fresh. All of Martine Leavitt's writing shows such care, thought, honesty, and intelligence. She's one of our best wr A touching story about a band of bighorn sheep making a journey to find a new place to live when their mountain home is threatened by encroaching human development. Along the way they encounter a wolverine, a bear, and a cougar. The young bighorn sheep, Tuk, who leads the band is put through the paces. The author doesn't spare him trouble. Tuk's responses to each confrontation are fresh. Blue Mountain by Martine Leavitt is told by Tuk, who is a Bighorn sheep! At first, life is good--running, jumping and playing. However, when Tuk becomes the leader of the herd, he must find a safe place for them or all will be lost. This book was a National Book Award finalist. So that should give you some idea of just how good this is. The author wrote this book for her grandchildren, but I think young and old will enjoy it like I did! 3.5 stars really. This was one of those weird books that felt like it was written for adults more than children. It was beautifully written, philosophical, and had the folklore and trickster elements that I generally love. I was reminded a lot of "Where the Mountain Meets the Moon." There is lots of animal death, turmoil, and conflict, all of which intimately connect the reader with the reality of nature, but unfortunately, I'm not sure how many kids will really connect with the story. Move over, Bambi, Blue Mountain is here! Interesting albeit rather pointless little book, which seems to have some kind of enviro-hippie lesson under its innocent text. I think it's a little slow for a middle-grade novel; with its limited vocabulary and not-so-subtle themes, it seems more appropriate for really young children. I chose this because my students are really into animal stories and I wanted some new recommendations for them, but I'm not the audience for this book. Perhaps someone who enjoys animals stories would give it a higher rating. While there is good information in this book and a nice story about animal survival in the wake of human incursion to their habitat, I personally felt the tone of the book was a bit stilted. This would be a good book for 3-5 grade students. Beautifully written, poetic, wonderful animal voices. Fable-like quality. Grades 4-7 -animals are ageless. Use, especially, as a writing example for 5th grade fractured fairy tales. This author writes her own stories for the animals to pass down with mountain as a creator. The writing was bit flat and emotionless, but the concept was interesting and this would appeal to those who love animal or adventure stories. It's also a shorter book, so appealing for more reluctant readers. The style of this story reminded me of the types of stories I read as a child. Tuk, leads a band of bighorn sheep to a new mountain, away from man.